Genuine Audi A3 8V (2012-1)6 drivers seat belt buckle. Collection preferred from near Barnsley South Yorkshire so you can see the condition for yourself. THEY WILL NOT BE SUITABLE FOR 2017 MODELS IN THE LATEST NEW SHAPE. IN FULL WORKING ORDER, READY TO FIT. FOR SALE IS NEW GENUINE AUDI A6 C6 2005-2011 FRONT SEAT SAFETY BELT BUCKLE SATIN BLACK TO FIT -AUDI A6/S6 C6 (2005 - 2011). - PART FITS RIGHT AND LEFT SIDE. REMOVED FROM 2009 AUDI A6 C6 FACELIFT 2.0TDI CAG 6 SPEED MANUAL 102k MILES. WHAT YOU SEE IN THE PICTURES IS WHAT YOU WILL RECEIVE! OUR AIM IS TO MAKE SURE YOU ARE ALWAYS 100% HAPPY! (Taken from: 2007 AUDI A3 8P 2.0 TDI BKD, BLUE, 6 SPEED GEARBOX, 5 DOOR). YOU WILL FIND MORE INFORMATION ABOVE. All parts are used, fully tested and are in fully working order, unless stated in the title. For Sale is a Left Passenger Side Front Seat Belt With Pretensioners removed from a 2010 AUDI A5 8T3 3 Door Coupe. Part Number: 306369910. Please see item description for more information, you will receive everything you see in the images. SCROLL DOWN TO BOTTOM OF PAGE. Body Style PART FROM OR FOR. as All Car parts are off a UK Right hand Drive Car. I HAVE NO PART IN THIS NOR DO I KNOW THE PRICES. OR GOOGLE KJAYS. PART OF IRELAND OR CHANNEL ISLANDS AND EXCLUDES THE. PART NUMBER: 4F0857805E. GENUINE 2005 - 2011 AUDI A6 C6 OSR DRIVER. IRELAND, ISLE OF MAN, ISLE OF WIGHT, JERSEY. REAR SEAT BELT BLACK. We are much cheaper than the MAIN DEALERS. Complete Front end panels. Steel Latch ISOFIX Connector Car Child Safety Seat Belt Buckle Bracket For Audi A4 A6. 1pc x ISOFIX Interface Bracket. 1Pair x ISOFIX Guide Groove. Suitable for car: Audi A4 A6. Material: 4mm thicken steel pad. Removed from a 2013 Audi Q3 2.0 138Bhp - 5 Door Estate - Diesel - 6 Speed Manual - Engine Code CFFB. Q3 2011 To 2015. Seat Belt Front Reel RH. Cobalt Blue. “Great Bridge Parts” has high reputation for both quality and service and believes itself to be the market leader in vehicle recycling in West Midlands. Model: S4 B8. This item has been removed from a: 2011 AUDI S4 3.0TFSI. Make: Audi. Part type: FRONT PASSENGER SEAT BELT WITH PRE-TENSIONER. TRADE PARTS NORTH EAST LTD. Fuel type: Petrol. Year: 2011. Body style : Saloon. 2012 - 2016 AUDI A3 A4 DRIVERS RIGHT OFFSIDE REAR SEAT BELT. Slam Panels. THIS IS A GENUINE AUDI PART. THIS SEAT BELT IS A USED PART. Headlights & Rear Lights. All costs will be covered in this instance. Genuine Audi A3 8V (2012-1)6 passenger seat belt buckle. Collection preferred from near Barnsley South Yorkshire so you can see the condition for yourself. Audi A3 2017 - Onwards Seatbelt Driver Side O/S Repair Service. Models : 2017 - Onwards. This service involves you sending your seatbelts in to us with your full details inside with the parts. Did you know we our warehouse is in Leicestershire, you can collect or we may be able to drop off?. MODEL -AUDI A6 C6 2.7TDI QUATTRO ESTATE. Highlands, Ireland/Northern Ireland / Scottish islands/ Scilly Isles/ Isle of Man / Isle of Wight. PAINT CODE -LY7W. GEARBOX-HXM AUTOMATIC. ENGINE -BPP 132kW. Model: B7 2007 - 2009. Make : AUDI A4. Body: CONVERTIBLE. FRONT RIGHT DRIVER SEAT BELT. Colour: BLACK LY9B. Gearbox: MANUAL 6 SPEED. · Gearboxes must be filled with new oil upon installation. It is your responsibility to check that any part(s) supplied is correct prior to fitting. Part number: 8P3857705B. Removed from: AUDI A3 8P 1.9TDI 2005. Item: SEAT BELT. Condition: In good used condition, see pictures. WHAT YOU SEE IN PICTURES IS WHAT YOU GET. FOR YEARS: 2009, 2010, 2011, 2012, 2013, 2014, 2015, 2016, 2017 (2013). Audi Breakers. Seat Breakers. All A/C Compressors must have the A/C system flushed to remove any contaminants and the proper oils and Freon to be used. Don't Cover Glass we will do are very. If a chassis number is specified, you can use this to check with your dealer whether the parts fit. FULL CAR BREAKING . Audi A3 2003 To 2008 Seat Front RH. MODEL A4 B6. BODY CABRIOLET. PAINT COLOR BLACK LY9B. PART REMOVED FROM. ITEM CONDITION. MILEAGE N/A. PART NUMBER: 8T0857705 / 8T0 857 705 49C. TO FIT: AUDI A5 8T (COUPE) MODELS FROM 2008-2013. NOT SUITABLE FOR CONVERTIBLE OR SPORTBACK MODELS OR ANY AFTER 2013 . GENUINE AUDI PART. COLOUR OF THE SEAT BELT IS SILVER (49C). PASSENGER SIDE FRONT SEAT BELT. The table below contains further information. Exterior Colour Code. Manufactured Year 2010. Interior Trim Code MB. Air Conditioning YES. MANUFACTURERS PART NUMBER -. This item is a used vehicle part and may have signs of general wear and handling. (5) collections can be made from our site facility that is open to the public. 13) Gaskets, sealants and any bolt on ancillary is not covered by our warranty. example, head gasket is not covered. this is a wear and tear item. (AUDI Q5 Seat Belt 0000363027. Other Details: Mk2 (FY) 17-22 FY O/S Drivers Front Seat Belt Pre-Tensioned Black. Jersey, Guernsey, Scilly Isles) as well as for the Scottish Highlands. Audi A6 C5 Front NS Left Seat Belt Buckle. Donor Car: 2001 Audi A6 C5 Avant 2498cc. The New and Used Audi Parts Specialist for all Audi models worldwide. It may fit others. 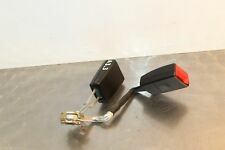 Audi Part Number: 4B0 857 755 D.
Donor Car: 2006 Audi A8 D3 4200cc Quattro. The New and Used Audi Parts Specialist for all Audi models worldwide. It may fit others. Audi Part Number: 4E0 857 805 B. Generic Notes on this Part: Colour code is 5J1 Silver and Suits Interior Codes LU LX KK KU KE. Our site is spread over 5 acres consisting of a reception area, two large storage buildings, de-pollutions bay, vehicle racking facility, in house crushing/bailing zone. THIS SEAT BACK HAS A COUPLE OF MARKINGS TO THE MATERIAL ON THE REAR OF THE SEAT AS SHOWN IN IMAGE 2 OTHER THAN THIS WE WOULD SAY THAT THIS SEAT BACK IS VERY GOOD CONDITION. Part number -OEM 4G8857705F. Title - AUDI A6 4G SEAT BELT FRONT LEFT. Model - A6. Donor Car: 2008 Audi A3 8P 2000cc Quattro. The New and Used Audi Parts Specialist for all Audi models worldwide. It may fit others. Audi Part Number: 4F0 972 571 B. REMOVED FROM 53 REG A4 SALOON. AUDI A4 B6 REAR SINGLE SEAT BELT BUCKLE. so you can make a claim. 4D0857703C V04. This is a rear seat centre lap seatbelt for the Audi A8 1994 - 99. This is a new, genuine Audi part. I have the facility to check if this is suitable before you buy. Part number details. AUDI A5 8T COUPE FRONT PASSENGER NEAR SIDE SEATBELT PRETENSIONER IN CREAM / BEIGE. FITS AUDI A5 COUPE MODELS 2007 - 2012. REMOVED FROM A 2008 A5 2.7 TDI. GENUINE AUDI PART. PART NUMBER : 8T0857705. FITS AUDI A8 MODELS 2004 > 2010. RRP £262.20 FROM AUDI. IT IS A PASSENGERS LEFT FRONT SEAT BELT IN SATIN BLACK, FOR RIGHT HAND DRIVE CARS ONLY. WE WILL HELP YOU FOR HASSLE FREE,SIMPLE AND EFFICIENT WAY TO HANDLE ANY ISSUES. THIS ITEM BEEN PROFESSIONALLY TESTED. 8S8857755 YLZ. 8S8857755YLZ 8S8 857 755 YLZ. TT / TTS 2015 onwards . This is a new,genuine Audi part. IT IS VALCONA LEATHER BASE COVER FOR THE RIGHT DRIVERS SEAT, THE COLOUR IS ALABASTER / BLACK. RRP £288.86 FROM AUDI. IT IS A DRIVERS RIGHT FRONT SEAT BELT IN SATIN BLACK, FOR RIGHT HAND DRIVE MODELS. TO FIT: AUDI TT 8J MK2 (COUPE) MODELS FROM 2006 - 2014. COUPE MODELS ONLY - THIS IS NOT THE TYPE WITH THE BUILT-IN PRETENSIONER! GENUINE AUDI PART. PART NUMBER: 8J8 857 805 B. IN GOOD USED CONDITION AND FULL WORKING ORDER. Pair of brand new sealed in original packaging seat belt buckles.